I am a UK citizen but never have I felt less so than upon returning to the UK via Heathrow airport. Having spent nearly 2 weeks abroad, returning to the UK should have felt like returning home, but the return through customs says anything but. Why is it that I am treated no differently as other Europeans? Why should I have to join the very long queue through customs for members of the EU, and not have a separate queue for UK citizens? Citizens of the USA have their own queue when they return to the USA, which confirms the importance of their citizenship, emphasises the value of it and, practically speaking, helps them to return more speedily. It makes being an American that bit more 'special'. Returning to the UK is a completely different experience. Europe means nothing to me! I have not taken part in any democratic decision-making that has 'sold-out' my nationality to a wider Europe. The Labour Party failed to uphold its promise of a referendum on what is effectively a European constitution. I don't feel European, or at least being European is of far lesser importance than my status as an English citizen, followed by being a member of the United Kingdom. Coming back home through Heathrow and being 'lumped together' with all the other Europeans, I felt that my status as a UK citizen was effectively 'null and void'; it has been cheapened to the point of irrelevance. I almost felt like 'a man without a country'! Well our experience of returning home from abroad will change now the UK is leaving the EU. I imagine all British Passport holders will be in the UK queue while all other nationals in the other! However it's also possible that as part of a Brexit deal EU Passport holders may still be given the same queue as us! ("The closest possible relationship")? Very unlikely but never say never! 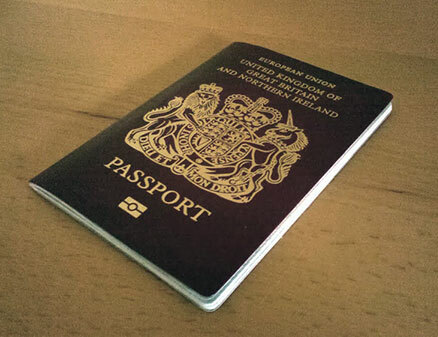 Home Office is redesigning the British Passport? Obviously all EU wording will have to be removed from cover & inside pages.The colour looking likely to return to the original dark blue? "Britain's EU Deal 'Reversible', Says Schulz"
You should learn to keep your big mouth shut Mr Schulz, you've just confirmed your intentions and real feelings toward the UK. DO WE REALLY NEED TO COWTOW TO THIS BUNCH OF DICTATORS THAT WISH TO RULE US IN THE UK? "Cameron admits this deal will not cut immigration or your right to self determination in your own country"
So there, you have it from the PM, his own words. Utter defeat for the UK, victory for the EU masters. Vote to stay in at your own peril, these people will not forgive and want to take revenge for your insolence at a later date. The deal with Mr Tusk was last night denounced by Mr Cameron’s critics as a fit-up. Be warned people, they will do anything to get a YES vote. All of these concessions will be revoked at the drop of a hat once the PRO EU establishment gets what it wants. Do you honestly believe that the EU masters will let the UK stop or reduce immigration thus forcing themselves to ever increasing numbers of migrants? I think not. It's no longer just migrants from Eastern Europe. It's now migrants from Somalia, Afghanistan, Iraq and Syria. I thought this country had spent billions in Afghanistan and Iraq to rid them of Saddam Hussein the dictator and also the Taliban. Why are these people so hopeless at looking after their hard-won [by us] democracy? Why are their new governments so feeble? Why are all the countries of the so-called New Commonwealth so corrupt? Is the UN doing anything about world over-population? No it is not! Asylum seeking is nonsense in a world where economic forces drive population movement. Over population is causing the wars, and poverty, and misery and the desire to move. ISIS would be nothing if the parents of the children they use in their wars had less babies and looked after those they already had properly. The third world is full of street urchins ripe for conversion to extremism and martyrdom. Regarding mmg’s post about EU immigration. Most EU migrants are young and come here to work so they will naturally be paying tax into the economy and be taking less in direct benefits like JSA, Income Support and Housing Benefit. However, they are also having large numbers of children; did the figures quoted by the papers include the costs of maternity care, child allowance, help with child day care costs and the considerable cost of free education for their children? If they stay in this country, these migrants will retire and probably claim pensions (which they will have paid for), pension credit, help with council tax and rent, and be needing medical care the same as older British people. We are always being told that we need these workers to pay for the pension of the current crop of older people but what happens when they get older? How many millions of new migrants will be needed to "support" them. We need to find better solutions to the challenges of ageing than constantly expanding our population beyond what the infrastructure and environment can tolerate. The social costs of mass immigration are a whole other story and always ignored by government. I recall Orwell saying that the English mistrusted foreigners and didn't like foreign food or wine. He wrote that over 70 years ago and would surely have to change his mind about the food and wine if he visited a modern High St or supermarket. He was somewhat guilty of linguistic xenophobia himself and mistrusted the use of foreign words and phrases, or words with Latin or Greek origin. Even "cul de sac" annoyed him. He preferred what he thought of as plain Saxon language. He wrote quite a bit about patriotism, which he approved of, and Nationalism, which he disliked, but I don't recall however, that he said that "the English must stop hating foreigners." Where did he say that? So, just because someone would like the UK to be a sovereign country again and elect governments, rather than changes of management, that equates to 'hating foreigners'. I don't think this is the case. Wanting to pull out of the EU and control our own borders (as it seems that the latter cannot be gained without the former) is a highly reasonable position to hold. Today's report about the contribution of EU immigrants being more than what they take out equals about £1 per UK citizen. Set that against the strain on hospitals, GP surgeries, demand for housing, impact upon the environment, demand for more energy and clean water and, not least, an ever-more creaking transport system, then I don't think the UK is getting a good deal. Furthermore, it is not just about the economic impact, but also about the cultural changes that the UK people have not asked for and, it seems, most do not want! Today's report also highlights the billions that it has cost the UK with immigrants outside of the EU since Tony Blair opened the immigration floodgates. If Labour gets in again, the costs will go up higher and higher. I've noticed when travelling in Europe that non whites take longer to get through imigration control. Therefore as you approach the queues for passport control, look at the queues and go to the one that has no non whites in it. You get through quicker. Good tip for faster travel. As someone have rightly said, UK citizenship is a legal status. It gives you the right to come to the UK whenever you want without needing a visa and that's it. It does not automatically give you any priorities or such like. Foreign diplomats and VIPs can go through customs faster without being a UK citizen. FFDTBack, the force of your post was lost when you referred to the author of this gripe as a 'tw.t', completely unnecessary and self-defeating. It seems to me that the author of this gripe has a legitimate complaint. S/he is a UK citizen and should be entitled to feel as such when returning to the UK. This is especially so when one considers that the European Union project has no real legitimate basis in that the country has not mandated politicians to give away UK sovereignty as they have done. People vote for MPs to attend Parliament and make decisions on behalf of them, but I very much doubt that they imagined that this would result in a loss of sovereignty. Until UK citizens are allowed a vote on membership of the EU - a clear one not a fudging one - then such gripes are entirely acceptable. Uhm. When an American or anyone else from outside the EU comes into Uk then they get channeled into the ultra-slow lane. You and the other Europeans get in to the fast no (or very few) questions asked lane. What do you want? A third lane creating that much more customs bureaucracy and confusion for arriving passengers? the vast majority of people in the EU lane are British already you tw.t so calm down. Unless people of colour and such are not your type of British - maybe you imagine a world where you are all white? The simple answer to the question of "...am I a UK or European citizen?" is that, as a UK citizen, I am both. Citizenship is a legal status, not a national identity. I, like most English men and women, have much more in common, ethnically and culturally, with most North Europeans than with a lot of my fellow UK citizens.